Not many people can lay claim to being a Paralympic gold medalist and a World champion whilst still being in their teenage years, Then again, there aren’t many people like Dylan Alcott. 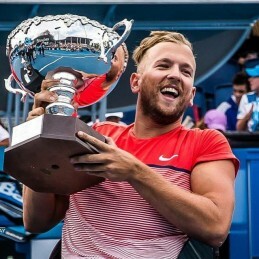 Dylan Alcott OAM, a dual sport athlete, has represented Australia on the international stage in both wheelchair basketball and wheelchair tennis since the age of 13. In 2008, at the age of 17, Dylan was a main contributor in the Australian wheelchair basketball teams (‘The Rollers’) gold medal victory at the 2008 Paralympic games in Beijing, becoming the youngest ever wheelchair basketball gold medallist in history. Dylan was born with a rare type of tumour wrapped around his spinal chord, which required immediate surgery only weeks after birth. After nearly 20 operations, all hope looked lost, as Dylan was not progressing as first thought, spending the majority of the first three years of his life in hospital. However, just after his 3rd birthday, Dylan defied the odds as his health started to take a turn for the better, and through sheer determination and hard work has been able to strive into one of Australia’s best and well-recognized Paralympians. In 2013, Dylan relaunched his tennis career, and was granted a wild card into the 2014 Australian open. After only 5 tournaments, Dylan has already won 2 of them, and is currently ranked number 10 in the world rankings. Dylan’s achievements are not only restricted to the sporting field. He is studying commerce at Melbourne University, fulfilling his role as the ambassador for the Variety Club, Scope Australia, OCS Group Australia and he was one of the four Australian Paralympic QANTAS ambassadors. Dylan’s true passion is his work as a motivational speaker, and through his inspirational story telling, Dylan is continually trying to alter and change the way people with disabilities are perceived in the wider community. He also works with the Starlight Foundation, brings disability awareness to schools, enjoys MC-ing events, and is a regular guest on many radio and television stations across Australia. He was also a national athlete spokesperson for the Australian Paralympic Team committee, and is world renown for his wheelchair crowd surfing at music festivals.